Arniflora Arnica Gel / 2.75 oz - Nature's Way®. 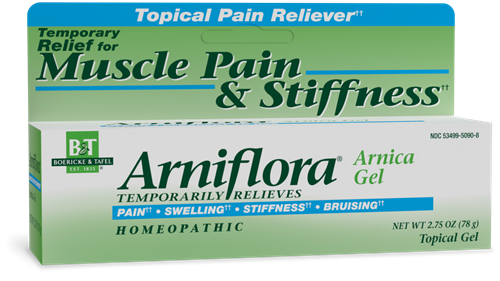 Arniflora® Arnica Gel is a modern, homeopathic preparation containing an 8% tincture of Arnica montana. A member of the Compositae plant family and similar to a daisy, Arnica grows in mountainous regions in the Pacific Northwest, central Europe, Russia and Siberia. Arnica tincture is made from the entire plant: stems, root, leaves and flowers. carbomer, ethyl alcohol, purified water, sodium hydroxide, witch hazel distillate. For external use only. Avoid contact with eyes or broken skin. Do not use if hypersensitive to this or any ingredients in this product. Breast-feeding women should not apply to breast area. Stop use and ask a doctor if: skin irritation, rash or other allergic reaction develops; condition worsens or does not improve within 7 days; symptoms clear up and occur again within a few days. These could be signs of a serious condition. If pregnant or breast-feeding, ask a healthcare professional before use. Keep out of reach of children. If swallowed, seek medical help or contact a Poison Control Center immediately.